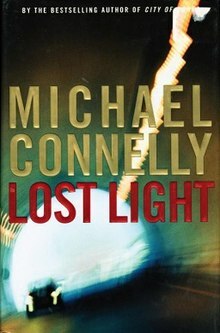 Lost Light is the ninth novel in Michael Connelly's Harry Bosch series. It is the first Bosch novel to be narrated in first person; all prior Bosch novels had utilized an omniscient third-person style. Lost Light is the first novel set after Bosch retires from the LAPD at the end of the prior story. Having received his private investigator's license, Bosch investigates an old case concerning the murder of a production assistant on the set of a film. The case leads him back into contact with his ex-wife Eleanor Wish, who is now a professional poker player in Las Vegas, and Bosch learns at the end that he and Eleanor have a young daughter. The poem referenced in this work is from Ezra Pound's "Exile's Letter:"
Lost Light is distinguished by the inclusion of a soundtrack CD to accompany the first hardback edition, featuring jazz music that Harry Bosch would have been listening to, including music of Art Pepper, Sonny Rollins and John Coltrane. This page was last edited on 3 June 2018, at 01:52 (UTC).